We celebrated our AGM recently with two performances, generously hosted by two Bromley nursing homes, given by Katie Clemmow (oboe, cor anglais and piano) and Margaret Archibald (clarinet and voice). Each home generously welcomed groups of our own guests to share the occasion with their own residents and staff. This was a rather unusual kind of informal concert as we wanted to showcase some of our workshop activities as well as offering performances of well- loved tunes. We had taken care to warn each of the Entertainments Organisers in advance, and so eyebrows did not shoot up when we cajoled members of our audience into playing chime bars to accompany Greensleeves and then forming a percussion orchestra as backing for a Mozart Rondo. Our residents were visibly uplifted by Margaret and Katie, they all thoroughly enjoyed joining in and taking part. Margaret’s enthusiasm is delightful and very catching – long may it continue. Everyone Matters is now in its second year as a company and its first as a registered charity. As the months have flown by the journey has been exciting, constantly fascinating and sometimes frustrating but certainly never dull. Our Friends have offered us wonderful support and encouragement, giving us the courage and energy to jump through hoops and slash through red tape to get the charity up and running. 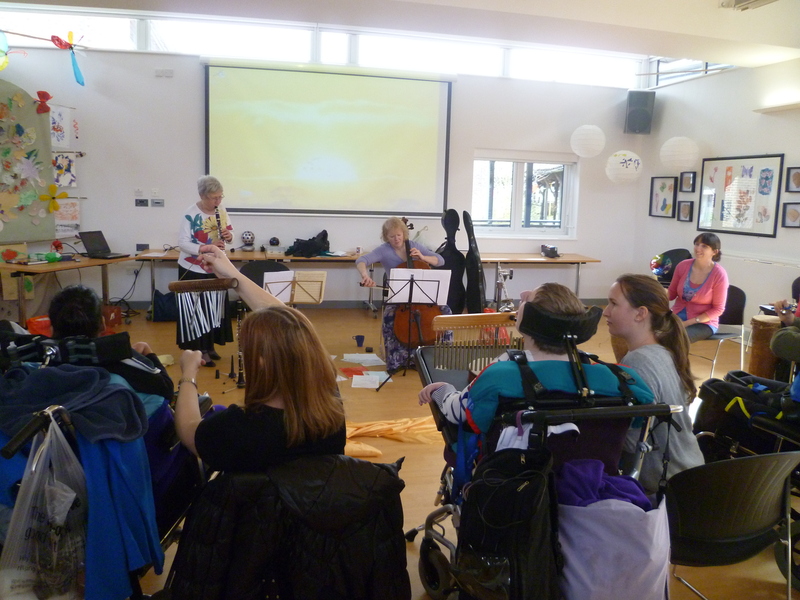 Donations and standing orders from friends and well-wishers have made it possible to mount a number of informal concerts in nursing homes and clubs for retired and disabled people in addition to our main projects to date in schools for children with a wide range of learning difficulties. We completed our inaugural project in four outer London special schools thanks to the generosity of Jessie’s Fund and now, with the support of the Lucille Graham Trust, we are developing “Mood Music”, a new project especially devised for children with profound and multiple learning difficulties, taking it to schools in Croydon and Surrey. When required by the Charity Commission to outline our objects in no more than 5000 characters the task seemed almost impossible, especially when we realised that this included spaces! However, the need to define our goals in this way proved very stimulating and it continues to inform the way that projects are devised, delivered and evaluated. One of our primary objectives is to take live music to people who would otherwise find it difficult or even impossible to access it. Collaboration is at the heart of every project and through a process of consultation each one is tailored to the needs of those taking part. Evaluation reports are completed by a project leader from Everyone Matters and by a key staff member at the host venue so that all concerned may learn from the experience. A particularly exciting development has been the introduction of our Young Artists scheme where young musicians are mentored by professional musicians from Everyone Matters to devise and rehearse an informal concert programme that they then perform together in a nursing home or day centre. Each project and performance devised by Everyone Matters is inspired by a love of the great musical masterpieces that so enrich the professional lives of the musicians delivering them. It is our hope that everyone engaging with us will leave our projects having discovered some new piece of music or enjoyed taking part in some new musical experience. Everyone Matters – and they certainly do. I always know that when Margaret asks me to do one of her events (they are not just concerts) I’m in for a fun time. According to the Musicians’ Union address book I play the French horn – according to Margaret’s list I play the French horn, tenor horn, hosepipe (when there isn’t a ban) and the piano. All the afore-mentioned fit into the boot of my car – N.B. the piano is electric, that is until we secure sponsorship from Steinway. What we wear for each event is now becoming more and more sophisticated – it used to be smart casual or smart “posh”. Events are now so varied I’ve even accompanied Margaret in her dressing gown – please note, she was wearing the dressing gown, not me. What a great year – and charity status too. 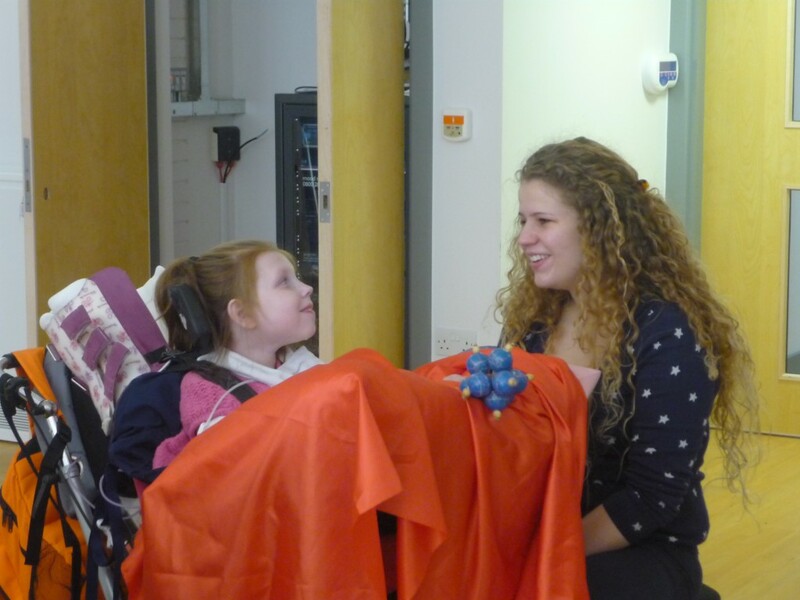 This new project was devised in January 2012 by Margaret Archibald and Julia Desbruslais for children with profound and multiple learning difficulties at Rutherford School. The project is being offered to The School for Profound Education at Tadworth in April, and to St. Nicholas School in Purley in May when the project will be adapted for young children with moderate learning difficulties, speech and communication disorders and autism. Julia and I visited Rutherford School for two linked workshop days; on the second day we aimed to bring to performance level music explored on the first day. We have enjoyed close links with Rutherford School over more than two decades, for many years as musicians with the London Mozart Players and more recently with Everyone Matters. Our aim is always to build on our experience at previous workshops in developing each new idea. An important goal was that we should work collaboratively with Rutherford School’s three regular visiting Music Therapists, with their detailed knowledge of each child’s response to music, and also with the Rutherford School care staff with their intimate knowledge of the children day by day. We were also keen to develop creative use of great classical repertoire by some of Western music’s greatest composers, each piece powered by its own characteristic rhythmic momentum and providing a safe musical space within a logical framework. Thanks to the experience gained when Everyone Matters delivered workshops alongside Stephen Haylett at Rutherford School in spring 2011 we retained what we had seen as a clear benefit to the children of working with small group sizes and mixed age ranges, thus giving them a different experience from their daily routine in the classroom. In this musical “hello” we played a sequence of well-known tunes with linking music between each one. The cello provided a continuous accompaniment and with my more portable instrument I was able to play the linking music and walk to each child in turn to perform that child’s special “signature” tune. We used this device as a “goodbye” at the end of the session, and on Day 2 we developed the idea further by adding a special percussion instrument for each child so that they could use it to say “hello” and “goodbye” to us. A few lines of poetry introduced each item and set the scene through vocal tone as much as through meaning. Coloured lights (available at Rutherford) bathed the room in colours to match the mood of each piece. Props and costumes helped to tell the story behind each piece of music, with a special role for lengths of brightly coloured silks that sometimes draped the floor and sometimes were worn by being draped around the children themselves, and because these children’s lives are often so static we sometimes asked the adults to create movement in the room by swirling the fabrics around. Percussion instruments were matched to the style and character of each piece and were chosen so that children could experience them, if possible by striking or waving the instruments themselves, or by feeling the vibrations against their skin or through their clothes where they were unable to manipulate them. The adults were always on hand to back up the children so that, if at all possible, the children could choose when and how sounds should be created. Introduced by a few lines from The Silver Swan. – blue fabric “river” and feather boa “swan” – dream chime that helpers could hold for children to sweep their fingers through to create a gentle chiming, creating a peaceful, floaty mood. Introduced by a stanza from West Side Story. – bright red-orange fabric – Latin-American costume – castanets and maracas to establish the characteristic Latin-American dance rhythm. Sequence: – establish rhythm– add children’s different pitch maracas –introduce red-orange fabric and lighting – add cello accompaniment – clarinet rides in with tune. Introduced by a few Lines on Westminster Bridge. – golden fabric and lighting – jingles, either held or worn around the wrist, for a sparkling sunrise effect. Sequence: – establish cello pizz – add golden dawn lighting effect – add jingles – add arpeggios on clarinet – cello swings into the tune. Introduced by lines from A Piper. – multi-coloured fabrics – large and small drums struck by hand or with beaters for a mood of celebration. Sequence: – shifting coloured lighting and coloured fabrics give a disco feel – the cello establishes Bartok’s dance rhythm – drums join – clarinet adds tune. On Day 1 we introduced four contrasting pieces of music, two peaceful items (The Swan and Morning) and two lively pieces (America and Cushion Dance). We performed each piece for the children while at the same time associating each piece with a few introductory lines of spoken poetry, with brightly coloured sari lengths of fabric and with ambient coloured lighting (thanks to being in a room which made this possible). We then engaged the children and their helpers through atmospheric use of different types of percussion as we performed each piece for a second time. The Swan was accompanied by gentle dream chimes, America featured Latin-American style maracas, Morning used tinkling bells and oriental cymbals and Cushion Dance provided a chance to play drums, large or small as appropriate to each child. 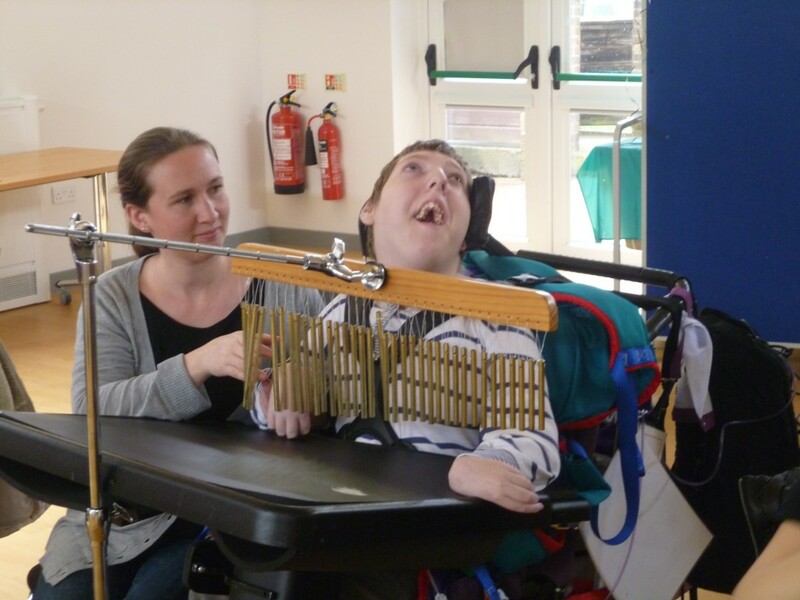 The children were invited to play the percussion instruments to whatever extent was possible for them, or at least to experience the sound of percussion at close quarters through their adult carers enabling the sounds for them. Strong rhythms were provided thanks to the participation of Rutherford’s Music Therapists Sarah Kong and Victoria Brock, underpinned by our own orchestral instruments and, in the case of America, by my drumming feet! The pre-planned groups of children necessarily changed as the school adapted to cope with each child’s individual needs throughout the day; I suspect this was a headache for the Rutherford staff but it was not a problem for us as we were always helped by the staff to work with each child in ways appropriate to them. I was very happy to be able to build on the experience gained last year of keeping group sizes small, something that enabled us in each session to relate to individual children. We began every session with a hello song devised by Julia in which a short linking phrase led to a special tune personalised for each child in turn, and this was a lovely device for giving each child a sense of being special; eye contact was achieved with several of the children, especially at the end when each child’s special piece was used to say goodbye. Because group sizes were so small it was always possible to achieve giving each child their own special musical moment but in a short space of time. Our aim on Day 2 was to work at specific pieces requested by each group, developing percussion effects and rhythms, making more vivid use of scenery, props and lighting, and bringing the whole together into a satisfying performance that enveloped the children in a multi-sensory and multi-art-form experience. Julia and I developed the hello and goodbye songs by finding a special percussion instrument that each child could play, perhaps with some extra help; we took care to repeat each child’s special tune from Day 1 and so hoped to create a link and a sense of progression across the two days, separated as they were by only one intervening day in the same week. We introduced a few new pieces of music and used them in short performances to enhance the mood of each participatory item; thus the slow movement melody from Dvorak’s New World Symphony created a still, quiet “darkness” from which “Morning” could grow, “Consider Yourself” from Oliver provided a rousing introduction to the strong rhythms of “America” and Mozart’s Rondo alla turca involved the children and their helpers in playing jingling percussion as an introduction to some energetic drumming in the “Cushion Dance”. Music Therapist Stephen Haylett supported me and Julia throughout Day 2, using percussion to enhance our musical ideas and using his intimate knowledge of the children from his music therapy sessions with them to guide us in helping each child to join in to best effect. “I expected an interactive music session for the children, involving instruments for the children and music to listen to. My expectations were exceeded; the additional use of moving fabrics, lights and enthusiasm from both Margaret and Julia created a captivating ambiance and created a supportive atmosphere for the children. The spoken introductions/ setting the scene worked well for both staff and children. I enjoyed the whole atmosphere created and was really impressed by the way Margaret and Julia spoke to the children – they used a tone of voice that was exciting, engaging and yet not patronizing. I felt staff knew what was expected of their role and everyone joined in whole-heartedly. “Living in the 21st century where life rushes by and there seems to be so little time to make people feel valued and important, it is a real privilege to work for an organization that lives out its name Everyone Matters.